The British offshoot of German anti-immigration and islamification group Pegida have staged their first protest in London. In response, anti-racist activists from Unite Against Fascism have staged a counter protest of their own. The opposing rallies shut down an area of central London next to parliament and Downing Street with scenes that RT’s reporter Harry Fear described as “electrified and tense”. 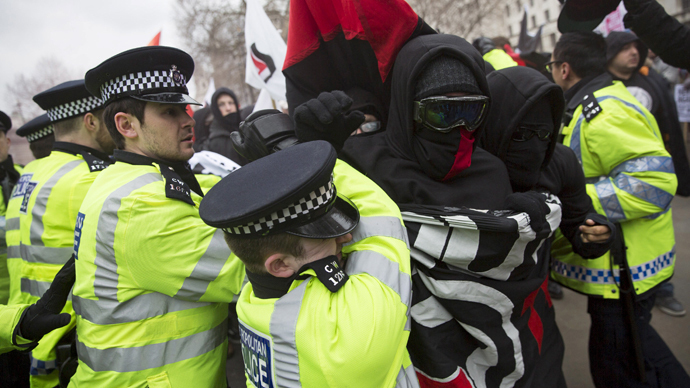 There have been clashes between police and protesters and a number of arrests have been made. Sand bombs and smoke grenades have also been used. Pegida say they are out on the streets to protest against radical Islam and excessive immigration into Britain. The numbers of tose rallying are in the tens rather than the hundreds, and have been contained by the police. “We’re an awareness campaign and we are patriots against the islamification of the West and that means we value our British culture and values, and that’s how we want to live. We don’t want an evil ideology to come in here and tell us how to live,” one of the leaders of Pegida in the UK told RT. Unite Against Fascism protesters were gathered behind another line of police and police vans, as were a smaller contingent of the Black Block element who are also anti fascists. A member of the anti-fascists who did not give his name told RT why he thinks what Pegida stands for is dangerous. “We have heard time and again that groups are being against migrants and against the Muslim community in different ways and what that ends up doing is consolidating and codifying what were traditional forms of racism and hatred against new communities because somehow its acceptable to do that,” he said. Pegida was founded last October in Germany and had been holding weekly rallies for 5 months since then. The largest demonstration to date drew 25-thousand protesters in Dresden. Pegida rallies have often been accompanied by counter-protests.